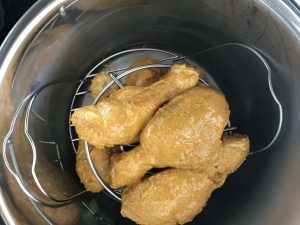 An easy Instant Pot & Oven recipe for Tandoori Chicken, a popular Indian spiced roast chicken. 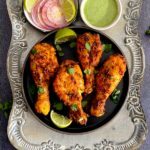 Chicken is marinated in yogurt and toasted Indian spices, and grilled till it's tender and juicy on the inside, and golden and crisp on the outside. 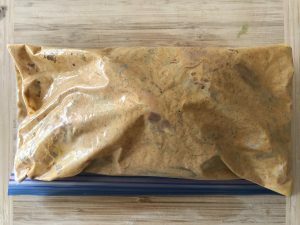 Marinate the chicken: In a large ziplock bag, or a mixing bowl, mix together all ingredients listed under "Marinade". Add skinless drumsticks, close the bag tight and toss it well to coat the chicken with the marinade. Refrigerate the chicken anywhere from 30 minutes to overnight. Cooking using Instant Pot: Turn Instant Pot On. Pour 1 cup water in the inner pot (adjust for your pot size). Place the trivet, or a steamer basket in the pot. Remove chicken, shake off the excess marinade and place on top. Stack the drumsticks on top of each other. Close the lid. Vent set to Sealing position. Pressure cook on Manual/Pressure Cook for 12 minutes. If using boneless thighs, reduce time to 6 minutes, Boneless chicken breast- 8 mins; Chicken tenders- 5 mins, bone-in skinless chicken breast- 12 minutes. Open after NPR 10: Wait for 10 minutes before releasing the pressure naturally. To do that, turn the pressure knob from Sealing to Venting position. Remove the chicken and place it on a lined baking sheet. Place it under the broiler for 2-3 minutes to crisp up the chicken. This step is optional and can be skipped. Drizzle some fresh lime juice, and, for an extra zing, sprinkle some Chaat Masala over it. Preheat oven to 350F. Line a baking tray with foil. Remove chicken from the marinade, shaking off excess and place it on the tray. Bake for 20 minutes, then turn the chicken and bake for another 15-20 minutes on the other side, or till chicken is cooked through. Remove from oven. Drizzle some fresh lime juice, and, for an extra zing, sprinkle some Chaat Masala over it. I slice the chicken breast in half, horizontally. That reduces the cook time and chicken cooks evenly. Line a baking tray with foil. Remove chicken from the marinade, shaking off excess and place it on the tray. Broil for 7 minutes on the first side (presentation side), then flip the chicken and broil for another 6-7 minutes on the other side, or till chicken is cooked through. Grease the grill plates with some light oil. Remove chicken from the marinade, shake off excess and place it on the medium-high part of the grill. Avoid the direct heat area as the chicken will burn before it cooks. Cook the chicken 5-6 minutes on the first side, flip it and another 5 minutes, or till it is cooked through. Drizzle some fresh lime juice, and, for an extra zing, sprinkle some Chaat Masala over it. Serve with cilantro chutney, pickled onions and store-bought Naan.